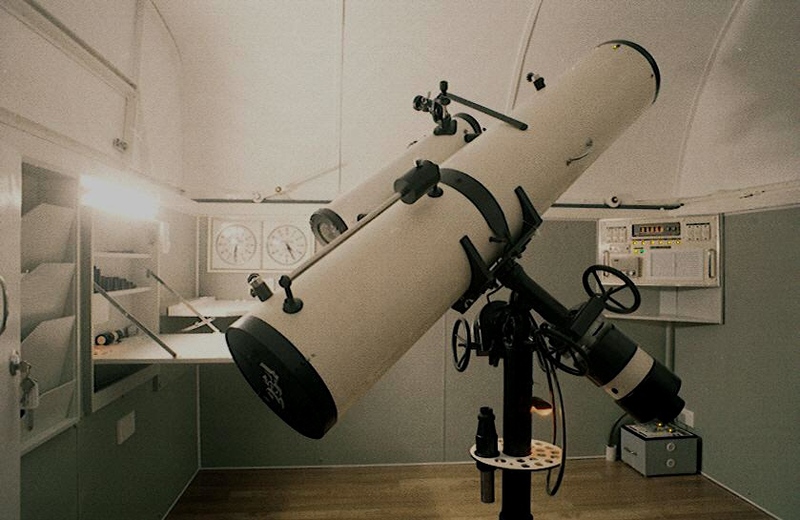 The writer has been interested in astronomy for over 60 years, and purchased his first telescope, a Yashica 3.3 inch (84 mm) reflector, with his first pay packet in 1961. It is still in use. He built his second telescope, a Newtonian with a 254 mm mirror, in 1966-69. 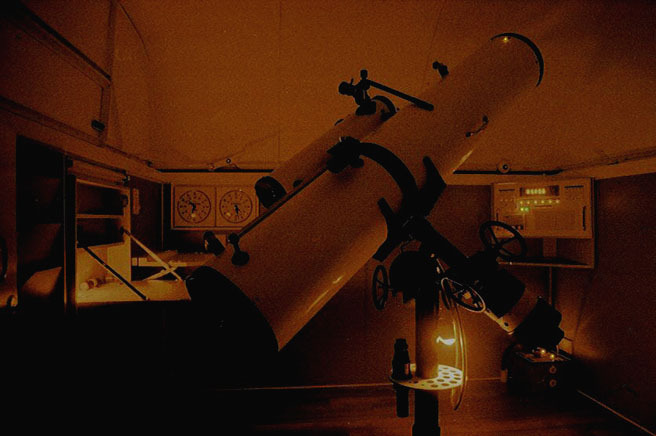 When living in Warwick he built the East Warwick Observatory, a teaching and research facility which operated successfully from 1970 until he was transferred away from the Warwick area. He came to the Sunshine Coast in 1982 and was Principal at Mapleton State School until he retired in July 2002. After his retirement he spent a year establishing the Mapleton Observatory in the school grounds. 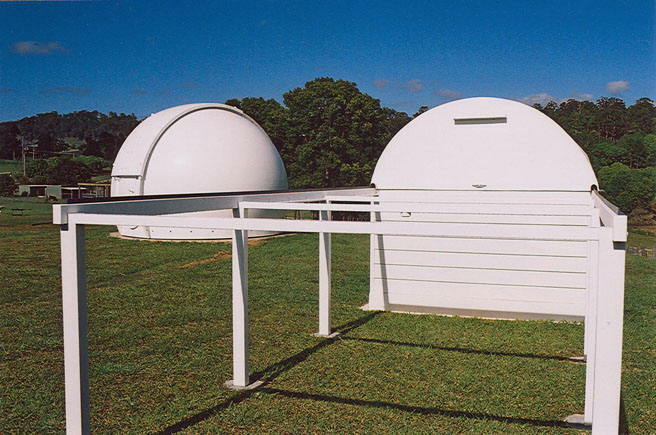 Relocating the East Warwick Observatory to Nambour in 2005 and rebuilding it as the Starfield Observatory was another post-retirement project. 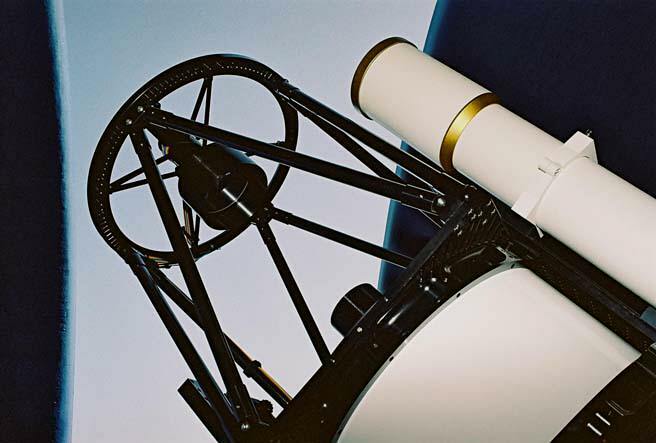 The 254 mm Newtonian telescope was completely refurbished and the optical surfaces enhanced. 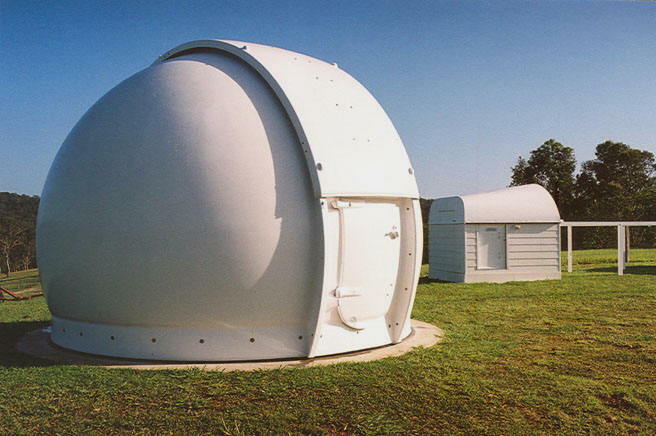 A second building, a 4.5 metre Astrodome, was installed in July 2006 by Col Blumson of North Arm. A heavy telescope pier and power column were fabricated by Scott & Ensoll of Kunda Park. Many thanks to Manager Barry Bayfield for his help and interest. These items were installed over the Easter weekend of 2007. 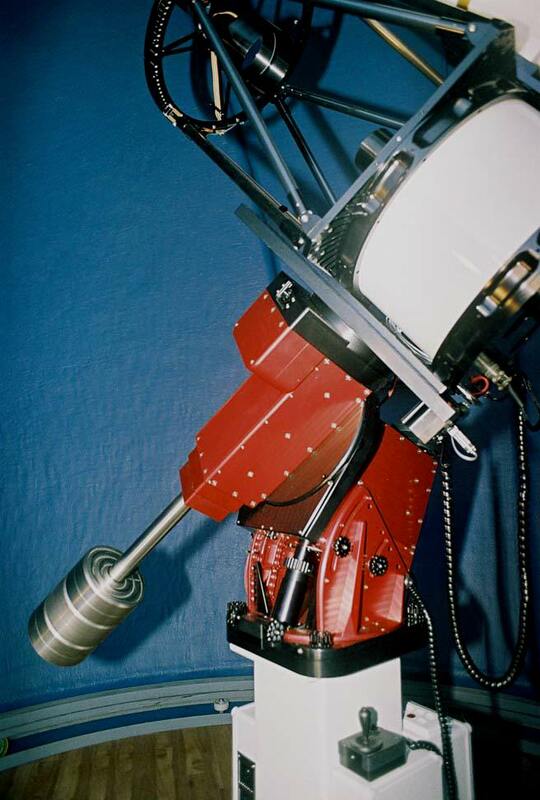 A computer-controlled Paramount ME telescope mount arrived from Golden, Colorado and was erected on the pier after the security system was installed. 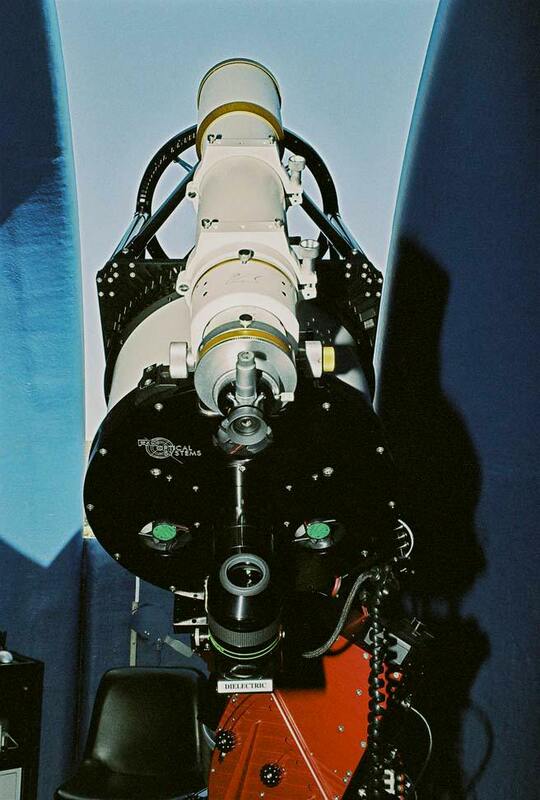 An STL11000XM full frame astrocamera was delivered on March 8 of 2007. 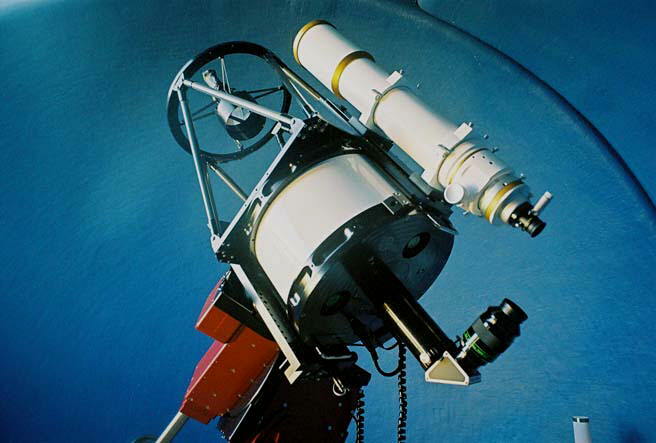 A new telescope arrived from Ritchey Chrétien Optical Systems of Flagstaff, Arizona in May and was placed on the Paramount. Commissioning of the telescope was completed by October 2007. 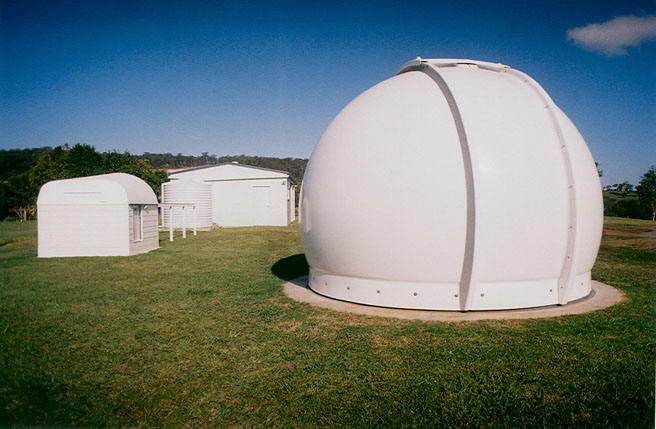 These units were ordered from the Australian agent, Advanced Telescope Supplies in Sydney. They are professional instruments which will allow a high standard of CCD astrophotography to be achieved. 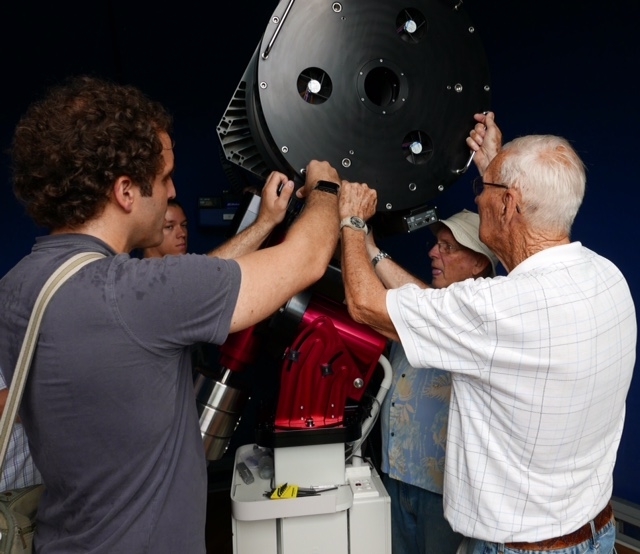 They will also provide the best views of celestial objects available to the public on the Sunshine Coast. On December 6, 2014, a powerful lightning strike caused severe electrical damage which necessitated the Observatory undergoing major changes to its hardware and software which are now complete. The Paramount ME has been replaced by a Paramount ME-II, which uses the latest version of the The Sky software (TheSkyX Professional) to control it. 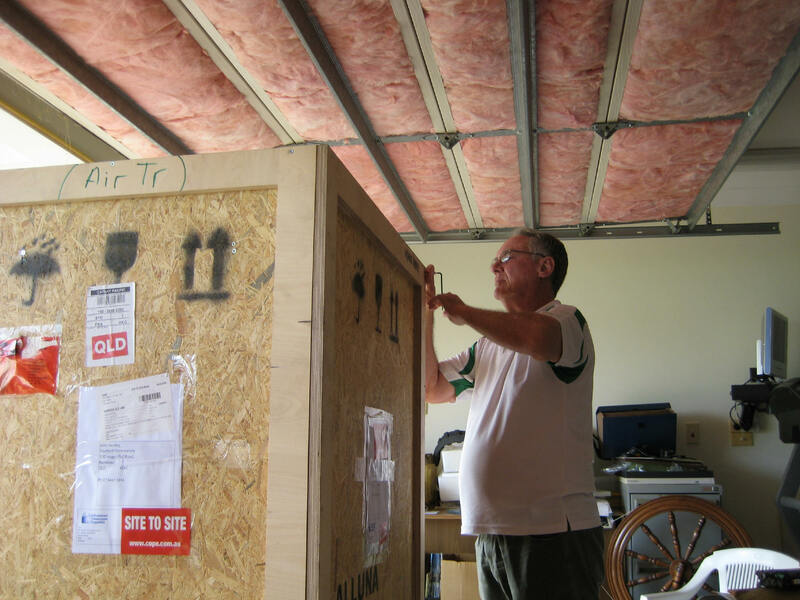 An Alluna Ritchey Chrétien telescope was delivered to Starfield Observatory on the morning of Monday, February 8, 2016. Many thanks to John Brinnand, Terry Clarke, Ray Hand and Richard Hilton who were present to assist with the delivery. one owned by England's Oxford University, and the other by Perth's Sacred Heart College. Matt Orrell and the writer unpacked the Paramount PME-II telescope mount and erected it on the pier on Thursday, February 11. The hand controller for opening and closing the dome shutter hangs on the wall behind. The north end of the polar axis with the main power and data junction cabinet behind. 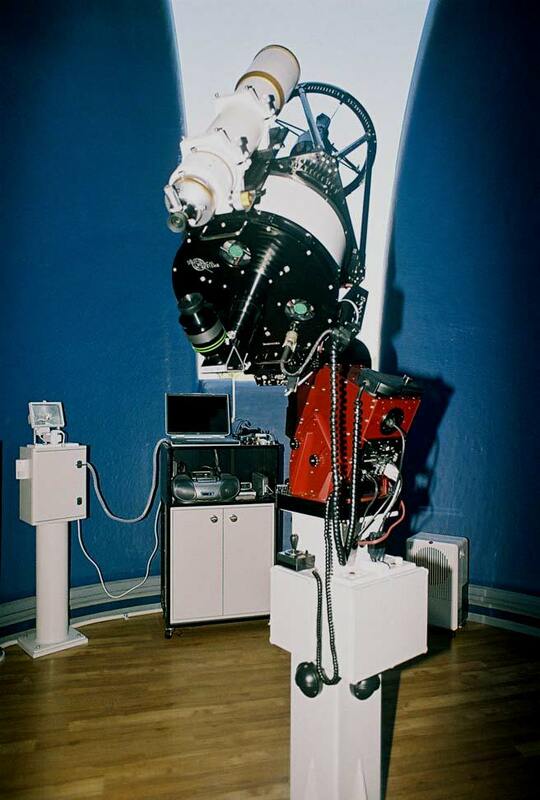 The Alluna RC20 was placed on the Paramount PME-II at Starfield Observatory on the morning of March 3. A Kelly Green crane was hired to perform the delicate lift of the optical tube into the Dome. The Alluna RC20 is taken to the dome. It is passed through the dome slot. It is very carefully placed upon the Paramount. The counterweights are adjusted for balance. The Alluna has to be placed in the correct position on the mount saddle to achieve good balance. The team who assisted with the installation: from left, Karen, Matt, John P., John H., Andrew, Bernie, Michael and friend. Grateful thanks to all who helped, particularly those who saved the telescope from a close brush with disaster. The Alluna RC20 on its mount, March 9. Tim, John and Bernie assisted the writer in balancing the RC20 on March 10. First light was but a few days away. The 105 mm and 77 mm apochromatic refractors are installed. For the past weeks we have been building the TPoint model for accurate slewing to sky objects. 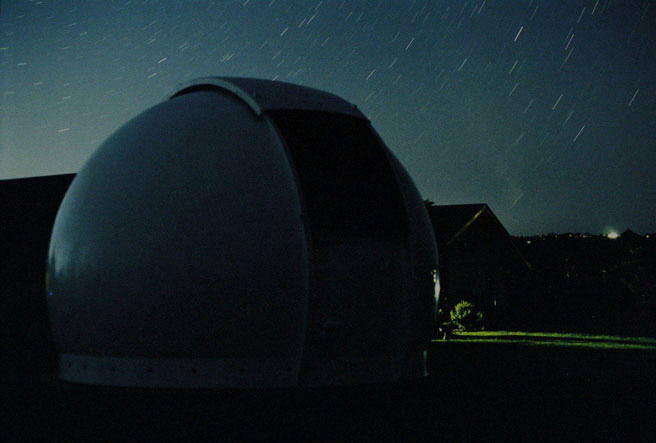 Older images of the Observatory prior to December 2014. 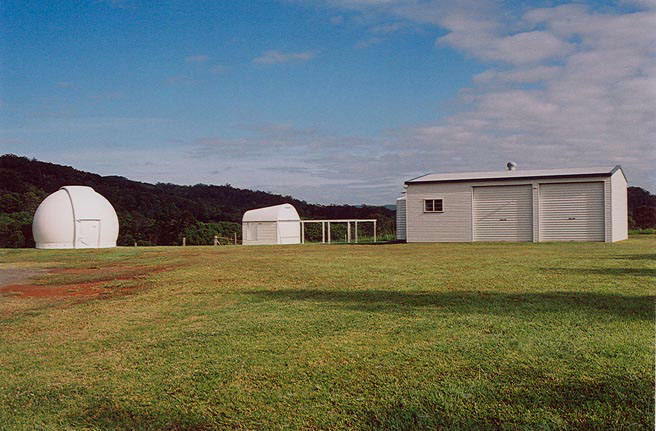 A general view of the Starfield Observatory at Nambour, with Astrodome, small roll-off roof Observatory, and workshop / display building. The Astrodome and the all-sky Observatory. 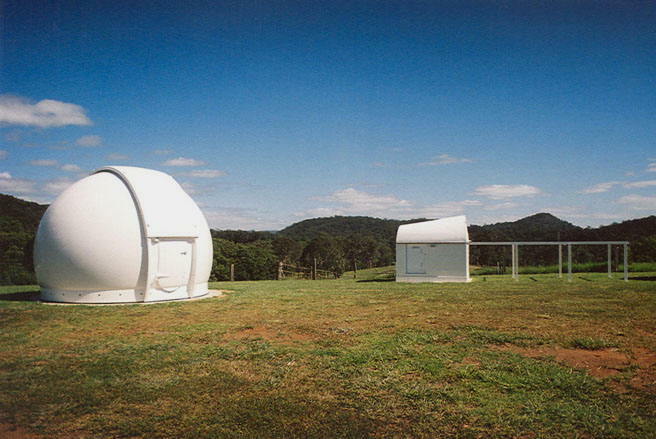 The former East Warwick Observatory as reconstructed at Image Flat (left), with the new Astrodome. The Astrodome has a diameter of 4.5 metres. The horizon at the site is unobscured in all directions. The roof of the former East Warwick Observatory rolls off the building on rails. 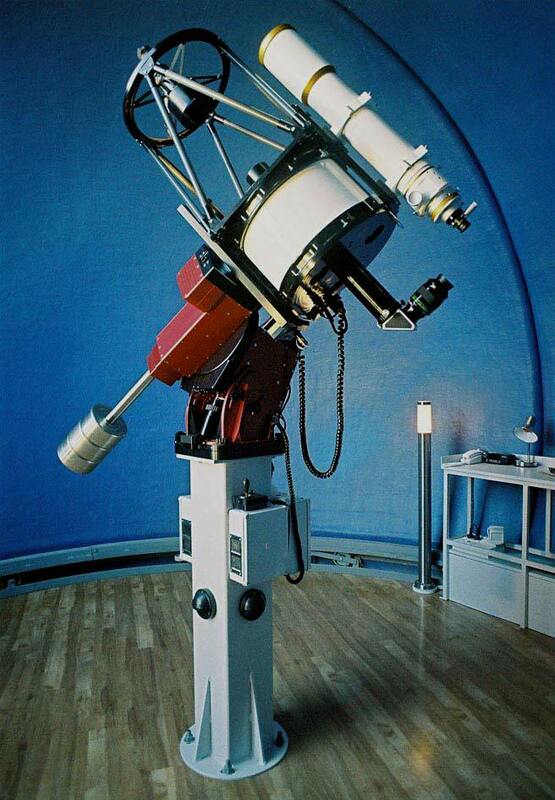 The interior of the smaller observatory, showing the 25 cm Newtonian reflector and ancillary equipment. Dim red light is used during visual observing, as it does not impede the eyes' dark adaption. The roof is rolled off to the south on rails as far as is required. Open for business. The red light has been brightened for this image. Comet 2006 P1 McNaught was photographed on February 6, 2007 with the equipment shown in the two pictures above. The stars and Comet McNaught wheel around the sky above the Astrodome on February 6, 2007. 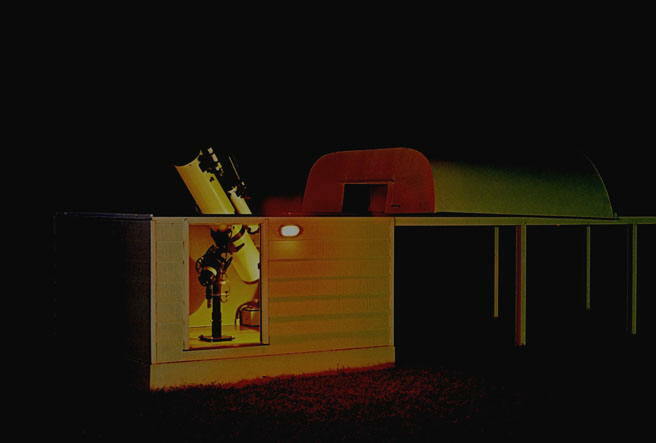 The interior of the Astrodome with the RCOS Ritchey Chrétien telescope on the Paramount ME. The Paramount ME robotic mount also used TPoint to achieve exceptional pointing and tracking accuracy. The optical tube assemblies, with the WO apochromatic refractor mounted on the RCOS. No finder scope is required due to the precision of the Paramount. The north side of the pier, showing the movable control console with laptop computer on the far side. The backplate of the RCOS telescope. The Telescope Command Centre mounted on the right controls remote focusing, heating and cooling of the optical elements. Observing the planet Venus in daylight. The observatory in readiness for a night's work. 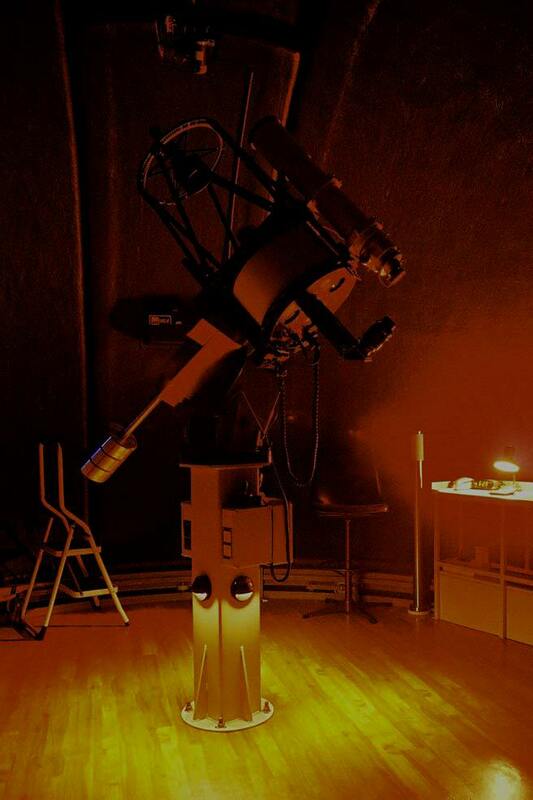 The observatory interior under red night light. 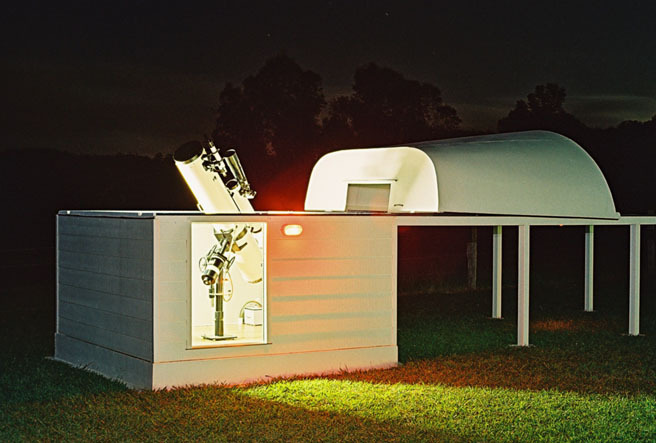 The writer is a past President of the Astronomers' Association of Queensland (two terms in the 1970s), and was elected a Fellow of the Royal Astronomical Society (based in London) in 1973. In 1980 he was contracted by NASA to provide pictures of navigation star fields for training Space Shuttle astronauts. 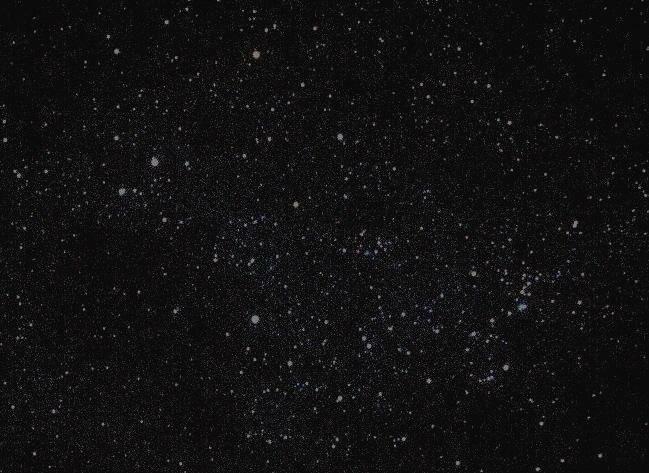 His first illustrated article on astrophotography was published in a British photography magazine in 1973. 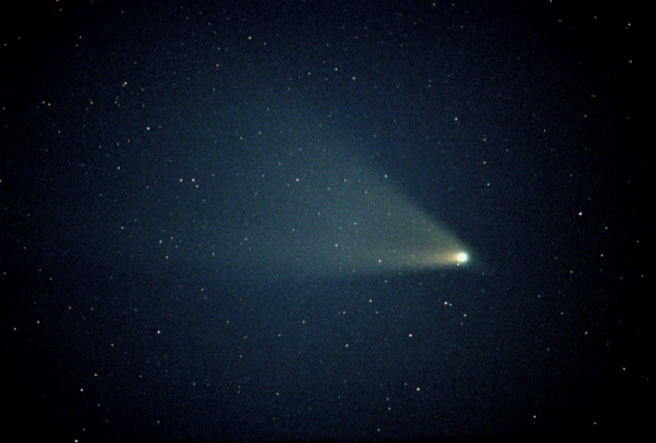 Astrophotographs of his appeared in the March 2003 Sky & Telescope and in the October 2004 issue of Night Sky, and are used to illustrate this website. 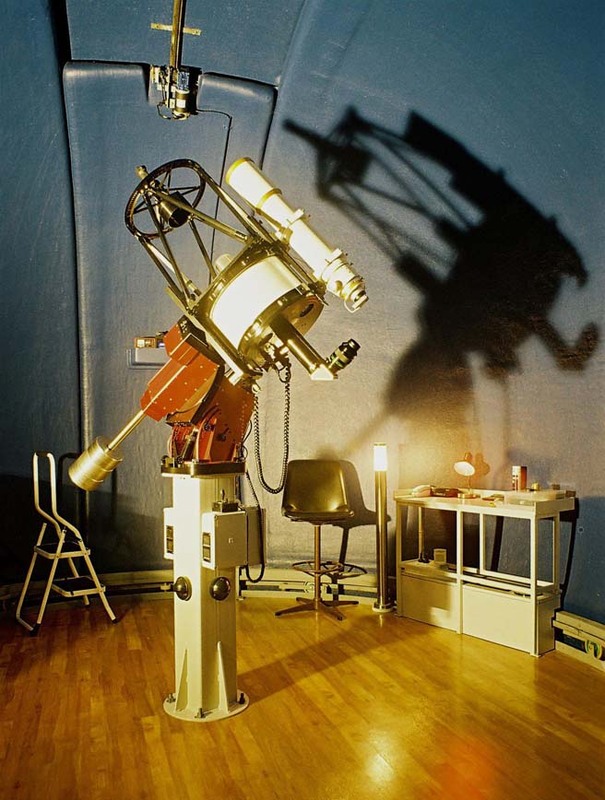 The main purpose of the Observatory is educational, which is why it operates this website and runs courses in astronomy. The starry sky is so full of wonders that it should not simply be the province of a few enthusiasts, but accessible for the pleasure of all. 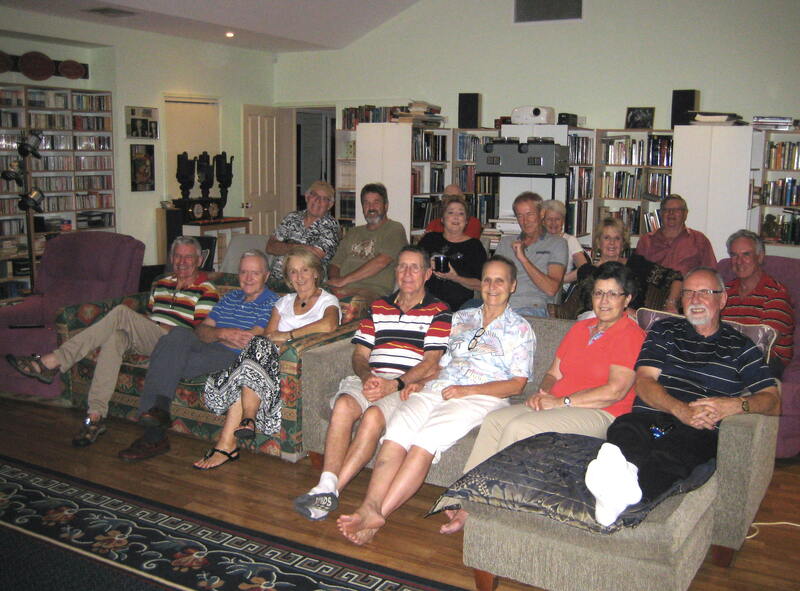 We are located 2 kilometres from Nambour on Queensland's Sunshine Coast, Australia.